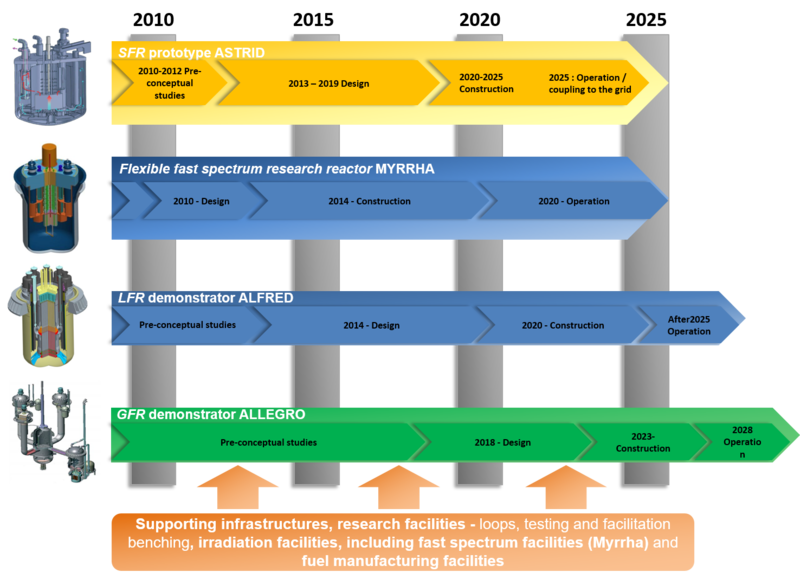 Stating that “to enable the commercial deployment of Generation-IV FNRs from 2040” is the industry’s objective, the ESNII roadmap foresees the R&D programme for prototypes and demonstrators, and also for commercial FNRs. In this context, the commercial-size (3600 MWt) Generation-IV European Sodium Fast Reactor (ESFR) can be considered as a candidate for the commercial deployment in Europe to follow up on the ASTRID SFR prototype. The ESFR conceptual design was developed by 25 European partners as part of the FP7 CP-ESFR project (2009 – 2013) with a total budget of nearly €12 M. Today it is considered to be one of the SFR options by the Generation IV International Forum (GIF), which is a cooperative international endeavour that performs the R&D needed to establish the feasibility and performance capabilities of the next generation nuclear energy systems.